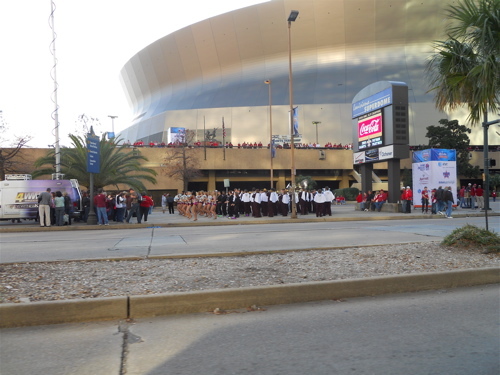 The bands were entertaining fans before entering the Superdome before tonight’s Sugar Bowl. It’s January 4th, and that means it’s time for another edition of the All State Sugar Bowl. With the Ohio State Buckeyes and Arkansas Razorbacks playing each other, one thing you can count on is a ridiculous number of people to be dressed up in red. Judging by the folks I’ve seen squeezing out of every hotel in the Central Business District, it appears occupancy is high. Every available outside cafe is full of fans tailgating as office workers weaved their way through the crowded sidewalks. While there is some juice for this game, most of the local enthusiasm comes from people in town hoping to see a solid monetary start to 2011, as both these fan bases deliver droves of devoted fans, ready to splurge on high-end hotels, food, drink and souvenirs. Most in the SEC have little appreciation for Ohio State. They routinely get beat like a drum by the top tier of this powerhouse conference. Arkansas is a middle of the pack SEC foe, but locals are supporting them because hometown favorite, the LSU “fighting” Tigers, battle in the same conference. 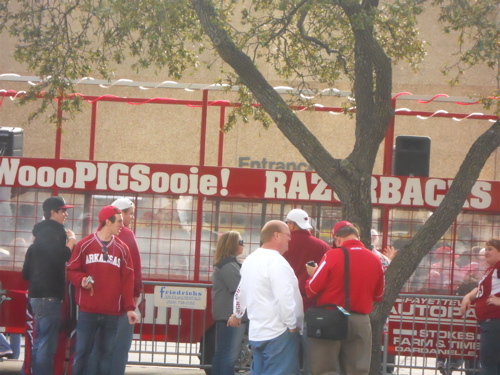 The Greeks at Arkansas get into the action outside the Superdome. This entry was posted in Events, News, Travel and tagged New Orleans, Sugar Bowl, Superdome. Bookmark the permalink.